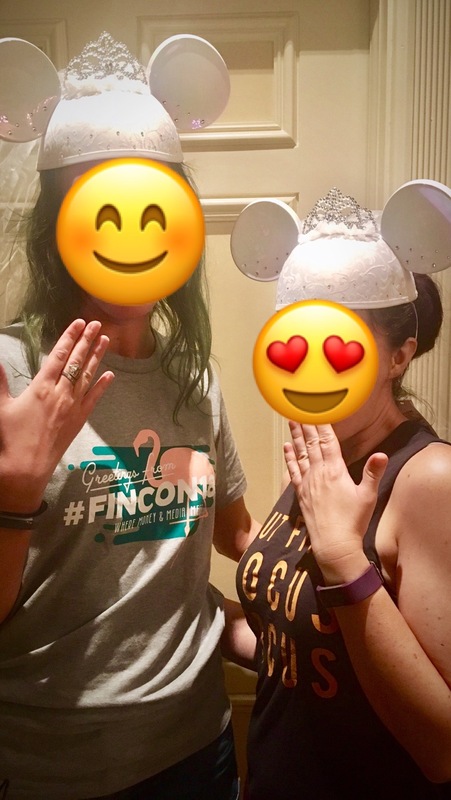 Actually we kinda sorta got married at Disney after FinCon. We just need to actually turn in the paperwork to make it official. And also do the paperwork. A picture makes things official, right?! My impending marriage of convenience aside, I’m not single. Obviously I’m not in this relationship for the savings! Financially I’m still single: we aren’t combining finances anytime soon and don’t live together. We haven’t even had any conversations about what combining (or not) finances would look like in a theoretical future together. So in theory nothing has changed. But even in a still relatively new relationship where we haven’t combined finances, I’ve been enjoying some perks. And as a result of not being single, I’ve been saving money on something that I hadn’t even considered would be an advantage. Specifically, I’ve saved some money on travel these last few months. And no, this isn’t a post about why the Southwest Companion Pass is awesome. Although that’s a fantastic travel benefit! I’ve done a lot of traveling this year. A lot of it has been for blog-related events (a lot of it). That also means I’ve bought way more plane tickets this year than I normally do. DC is great in that in theory I have three options of nearby airports so that I can pick and choose my flight times and prices; however, two of the airports are considerably less convenient for me, and even the closest one isn’t just a casual walk from my apartment. So regardless of which airport I’m going to, it costs money to get there and back home. Enter a major perk of being in a relationship! On a couple of occasions I’ve been able to get to the airport without paying the approximately $40 I normally would by taking a Lyft each way. Sure, I could take public transit, but not at 5:00 in the morning. For one, I’m not getting up that early, and also thanks to a reduced schedule the metro is no longer open as early or as late. I take the metro when I can but sometimes it’s not feasible. Plus, as demonstrated by the early morning party from DC to FinCon, money bloggers fly the cheap flights at both extremes of the day so I’ve got a reputation to maintain! Yes, my hack for free airport transportation is being in a relationship: I’ve gotten both early morning and late night rides to or from the airport when my boyfriend would normally be asleep. He’s the best (and is also constrained by the fact that it’s easier to make those requests of a partner than of a friend, since I suspect many friends wouldn’t feel as obligated. My friends are also lucky that very few of them have cars so I don’t ask them anyway 😂), but also sometimes I question his judgment when he offers me a ride at some ungodly hour without me asking for one. But that’s okay, I’ll go ahead and benefit from his questionable choices and take the ride! Knowing I have a ride (after checking to make sure my partner’s willing to disrupt his sleep a bit, of course) has affected which plane tickets I’ve bought. I’ve made the decision to take different flights/fly into a different airport than the one I normally would because I have a ride. That means I can choose a cheaper flight, knowing it’s actually cheaper; sometimes the cheapest flight isn’t worth it if I have to pay a ton and/or spend a whole lot of time and effort getting home from an airport that’s further away. I often end up spending a bit more on the slightly more expensive ticket because it’s way less of a hassle to get home. On the other hand, on one occasion I chose a slightly more expensive flight into a further away airport thanks to having a ride because it was at a more convenient time for me. Normally I would’ve chosen the cheapest option since it was to the airport closest to my apartment. But that particular flight got in at 11:45pm. I am willing to pay more to get in more than an hour earlier and not be so miserable the next morning! But I’m much more willing to do that when I don’t have to pay for transportation on top of the extra cost of the ticket. Especially when said transportation I didn’t have to take would’ve probably gotten me home more or less the same time as the later flight, given how big of a pain it is to get from that far-flung airport to my place. Without a ride, I probably would’ve sucked it up and taken the later, cheaper flight with the less awful/long and less expensive transportation option. Wait, it’s only about free taxi rides? Clearly that’s not the only financial benefit (or benefit, period) of changing up my relationship status. Even without combined finances, having moral support (and someone else to look at my resume so I can maybe work on closing the gap between our incomes?) is a really awesome feeling. But having a ride to the airport is a benefit that I never would’ve considered before experiencing it. Having someone to take you to/from the airport is a huge plus! I’ve traveled a fair amount this year too. And knowing my partner (or his parents) will pick me up is a huge relief, especially because we live so far away from the airports. Yeah I can imagine if it’s a long drive it’s even better to have a ride! For the most part (unless it’s super late or early) I can take public transportation but it’s definitely nicer to have a ride. You get rides and he gets cookies. Seems like a fair trade to me. The only thing is, I don’t get any of said airport transportation benefits these days as it’s rare that the husband and I travel separately now 😉 That and I’m too darn cheap to have him drive the two hour round trip to pick me up when I can take public transportation instead on the rare occasion I do go separately. Okay, congrats!! I had to find out what was going on after I saw a bunch of tweets about you & Mil$. First of all, congrats! Having someone to take you to the airport and pick you up is a big bonus IMO. I’d love to show up to DC early for FinCon but unless I take a redeye flight, that’s not going to be possible coming from west coast. Thanks, Bob! Yeah, cross-country/continent flights are tough with timing—it seems like you either have to burn a day or have to take an overnight flight and neither of those are ideal options!